The ultimate movie snack just got healthy! 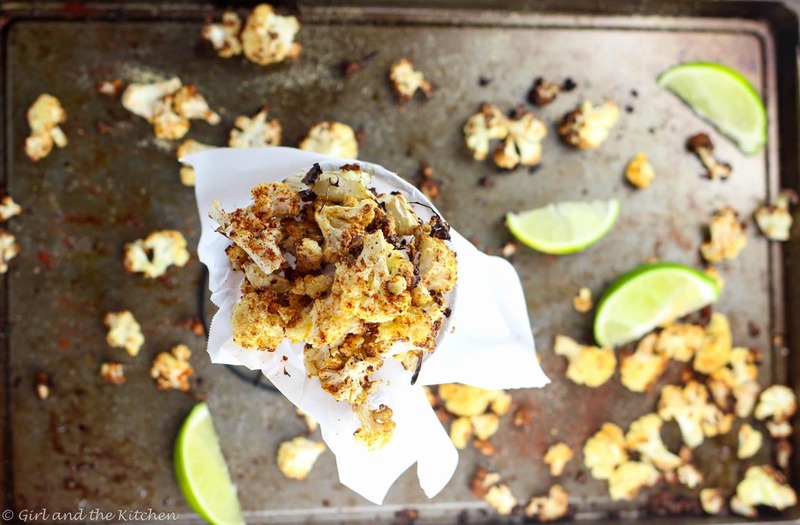 My chili lime oven roasted cauliflower popcorn looks as cute as the original but tastes a heck of a lot better! With subtle citrus notes and a spicy kick this faux popcorn is the perfect couch munch food. Massive flavor+zero guilt=heaven. Have I mentioned that my husband is a Coscto aficionado? He is… a big one. “I’m making a Costco run babe, we are out of Perrier and paper towels. Do we need anything else?” This is always the excuse to run wild and free through the never-ending wonder of Costco aisles. “Grab organic chicken, organic berries, organic frozen broccoli, huge bag of baby spinach, almond milk and some of my organic pita chips please.” At this he always looks at me puzzled and I then decide that it is better to text the list to him as his dormant ADD will kick in the instant he walks out of the door and gets into the car. This one particular time, hubs walked into the house after his Costco adventure…2 hours later! I calmed myself until I saw the ridiculously insane amount of odd items he had purchased. “Are you effing kidding me?” I yelled at him. “What? It’s all good stuff we can use!!! You never buy the food I like!” I call bullsh*t on that. -A lifetime supply of microwaveable popcorn. -A few bottles of shampoo, that I am not sure who will be using. -Container of every nut that Costco carries. Does this list look oddly unfamiliar to anyone? If you noticed that practically NONE of the items that I had requested were on the list you are correct and most likely as frustrated reading this as I was unpacking those items. And FYI…this does not include the multitude of packaged waters and God knows what else that was remaining in the garage. I went through almost everything except that wretched popcorn. This little story occurred 2 years ago guys. TWO. I STILL have that damn popcorn! Even though he made it almost every movie night I STILL have a ton left. Well, I did. I brought it into work and gave it away. “Mila, where’s the popcorn?” Hubs asked as he practically destroyed my pantry. He was a man on a mission and when he could not find something he needed at that very particular moment, the Tasmanian devil within him broke out. “We are out of popcorn,” I retorted as I scanned all the available movies on Apple TV. So I got up and decided to make us a snack. “I want something salty, crunchy, crispy, savory and healthy.” He ordered me from the couch. I swung open the pantry and pondered on what to make. Nothing really looked or tasted like what he wanted. I tried my chances at the fridge and I stood face to face with a gigantic head of cauliflower I had failed to use up this week. And something told me not to dismiss this. I cut the gorgeous head of cauliflower into tiny little florets and was amazed at how much they resembled popcorn! Gorgeous little popcorn florets!!! With even more nutrients and vitamins and a ton less carbs! An entire LARGE head of cauliflower only has 210 calories. Eat away! “Ohhhh what’s this…looks good, I thought we were out of popcorn?” he perked up immediately upon seeing this fancy presentation and taking a whiff of the smoky goodness in front of him. Take sliced up florets, drizzle with olive oil, sprinkle with salt, black pepper and garlic powder. Bake for 5 minutes then shake the pan making sure they are browning on each side. Repeat 2 more times until perfectly brown and crispy. Spray them with a bit of the pan spray and season with chipotle powder and squirt some lime juice on the cut up florets. Taste for seasoning and adjust with more salt, garlic powder or chipotle as you see fit. Note 1: Once the popcorn comes out of the oven, spray it with the pan spray and THEN season. This will ensure that the seasoning actually adheres to the popcorn. Yes I know all about Costco! My hubby will take forever to go through the store. I believe that the more time you spent in a store the more money you’ll spend. Take a list and get out of there. That’s the best way to do it. Thank you for the recipe — looks great. I think cauliflower is a miracle food — you can do so much with it. Yes!!! I am in and out in 15 minutes! Even WITH the Vitamix demos 🙂 I know, I was never a fan of cauliflower but now!!! It’s my fave! Mila. Your writing, the story, your photos, the recipe. Everything is just brilliant. Your blog is a destination for me for downtime, amusement, inspiration, learning and beautiful imagery. I cannot tell you how hard I laughed reading the story!!! And this cauliflower popcorn? It should go viral. It certainly deserves to. I know what I’m making the next time I pick up cauliflower. You rock girl! Sharing to my very best boards! Your husband may be ADD, but he’s certainly entertaining. You had me cracking up! And, I must say, I love the way you think, Mila. I’m a cauliflower fanatic and also have popcorn at least once on the weekend. I’m so excited to try this lightened up snack that I’ll enjoy just as much or more! Thank you Marissa!!! He is def entertaining 🙂 let me know how you like it! I’m really into cauliflower lately!! Love the spicy note here. Clever girl, Mila! I’ve only ever made roasted cauliflower for a soup and a mash, but why have I never thought of making it just to eat by itself? You’re right, it really is a bit like popcorn. I’ve never been much of a popcorn fan, to be honest, so I’d take this instead any day! P.S. Yes, why DO husbands everywhere go to supermarket and come back with random collections of things, none of which you actually needed. Teehee … we do end up with a few extra tasty treats that way sometimes, though! Ha! Neither my husband nor I need those treats 😉 thanks for the kinds words honey! 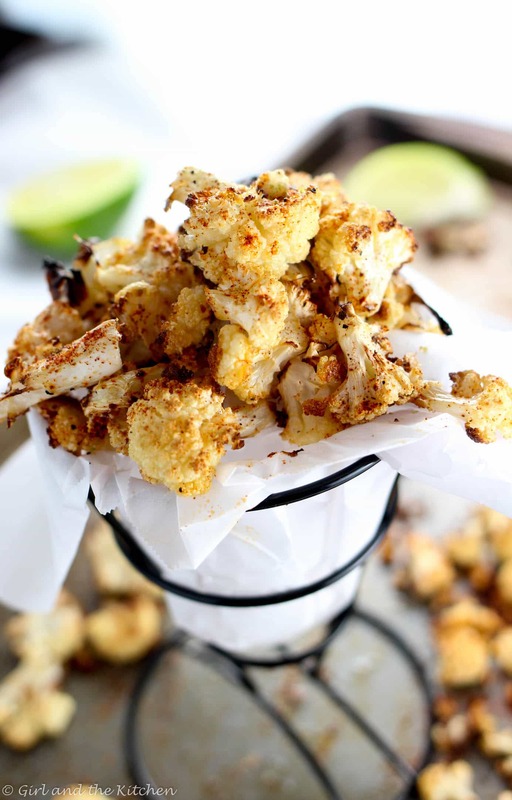 I love cauliflower but have never tried roasting it.. these look PERFECT to snack on.. Love the amazing flavours!! I’m with your hubby on the Costco run – so easy to get carried away! I have only been once (there are only a few stores in Australia) but am itching to get back. I bought soooo much random stuff! This looks amazing – I love cauli. That definitely seems to happen at Costco. It’s even worse here because they carry stuff that other supermarkets don’t like a lot of American brands so some people just buy them because they can’t normally get them! 😛 As for this cauliflower-major yum!! That cauliflower does look ridiculously good. The moral here though I think is go to costco yourself….alone. What a fantastic way to eat cauliflower! It looks delicious! Yummy! Already pinned! 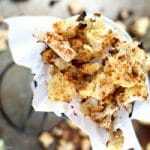 I absolutely love popcorn as a movie snack but I am going to have to try this recipe out! It looks too good not to! Definitively delicious cauliflower with chipotle. I have to try it! These look so good, and I’m all about the zero guilt! Thank you so much!!! Zero guilt is great! Yum! This ‘popcorn’ looks delicious. Perfect with a nice cold beer! Thanks Mel! I haven’t tried but I bet it would be!!! Great idea – I will definitely try this recipe. I think Costco brings out the shop-a-holic in all of us. But you ended up with a great cauliflower recipe out of it – looks great. 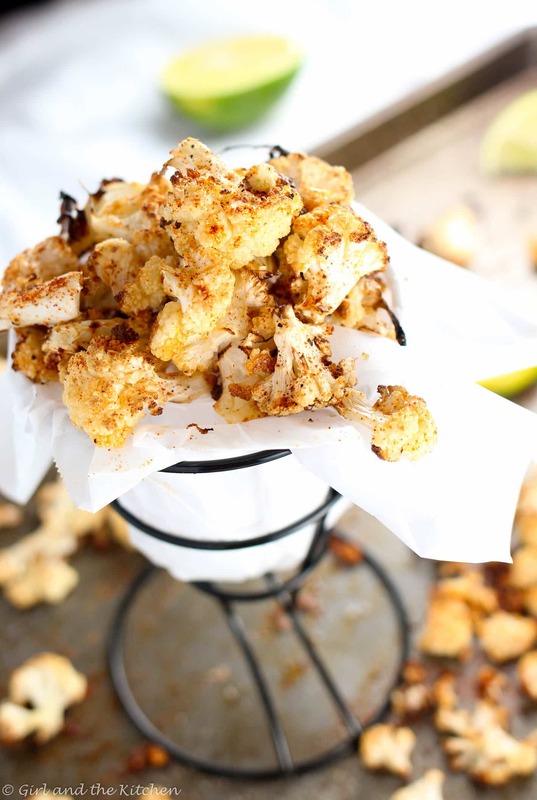 I love roasted cauliflower….my fav way of preparing it. Sounds great!! This post made me laugh!!! 😀 I’m the person who goes crazy at the supermarket… my husband is the one who asks me what in the world I would be doing with some of the things I buy!! But I always win, as he shuts up when he eats it! I LOVE this recipe!!! 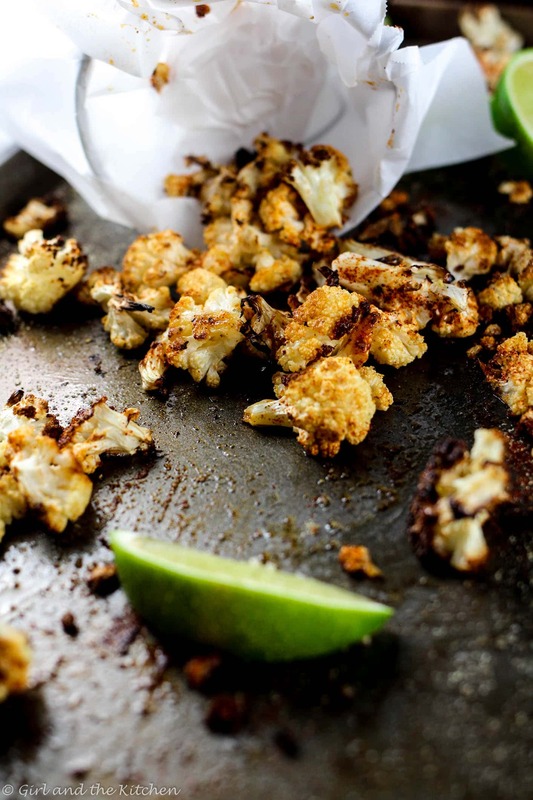 Roasted Cauliflower is a serious weakness of mine and chipotle lime?? I CAN TOTALLY have a BIG BOWL of it for move night!!! We ALWAYS have popcorn at home (not microwavable – the bulk kernels so I can control what I put into it) because my husband loves to eat them – I love it too but can’t have more than a handful 🙁 so this will be my next popcorn substitute and I can bet you my husband will put aside the popcorn for it too. No dice! It will be all mine! This looks like the PERFECT snacking food – Cannot wait to give it a try!!! And Costco is always dangerous – We call it the $500 dollar store! Yumm! These look delicious and healthy! Can’t wait to give it a try! Naw, all I can say is at least hubby went to some effort. I would have been happy with cod! As for this recipe, ANYTHING cauliflower is a winner in my books! Oh, this is gonna happen in my house! Sounds delicious, Mila! Pinning immediately!